By buying this product you can collect up to 5954 bonuspoints. 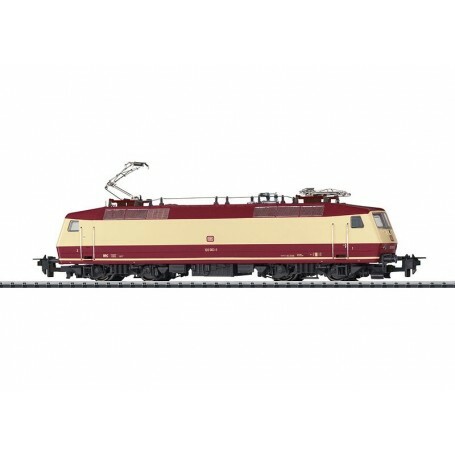 Diesellok klass 120.0 typ DB, för Trix Express, loket har digitaldekoder och ljudmodul, högeffektsdrivning, längd över buffertar 22,1 cm, epok IV-V.
Prototype: German Federal Railroad (DB) class 120.0 fast general-purpose locomotive. Pre-production version in its original paint scheme. Model: This model is for operation on 3-conductor Trix Express track. The locomotive has a digital decoder and extensive sound functions. It also has controlled high-efficiency propulsion with a flywheel, centrally mounted. All 4 axles powered. Traction tires. The triple headlights and dual red marker lights change over with the direction of travel, will work in conventional operation, and can be controlled digitally. Maintenance-free warm white and red LEDs are used for the lighting. The locomotive has separately applied grab irons on the sides and ends. A bridge plug for direct analog operation is included. Length over the buffers 22.1 cm / 8-11/16'. Highlights: Central motor, 4 axles powered. Close couplers in standard pockets with a guide mechanism. The Three-Phase Current Pioneer. The class 120 marked the technological change to three-phase current propulsion. This principle promised compact motors without commutators and largely free of parts that would wear out, commutator rings, brushes, and mechanical contacts. The performance specifications for this new development were broadly formulated as a wish list, because a wide torque range and rpm range can be mastered with three-phase current technology. The class 120 was designed to pull InterCity trains at speeds of 200 km/h / 125 mph and 5,400 metric ton freight trains, and be equipped with push/pull controls and electric regenerative brakes. In 1977, the DB ordered five experimental units, which were thoroughly tested on test stands, on test runs, and in operational use. Startup, tractive effort, acceleration, running characteristics, braking power, power consumption, and stability were part of the program. Comparison tests with other makes of locomotives as well as startup tests on the Lötschberg and Semmering grades confirmed the effectiveness of the technology. The speed record was 265 km/h / 165 mph. During the test phase, new developments were introduced, for example: microprocessors for faster monitoring and control. Components were constantly improved until all five units were technically at the same level in 1982 and were ready for regular production. During the several years of development, the purchasing policy changed, however. Instead of all-round locomotives, special locomotives were once again preferred on the basis of common development platforms with many parts in common. Therefore, only the first production run of 60 units were purchased of the class 120. The five prototypes continue to be used for test purposes, and the regular production units are still proving themselves in daily railroad operations. Cars to go with this locomotive can be found under item numbers 31161, 31162, and 31163.